Q1. 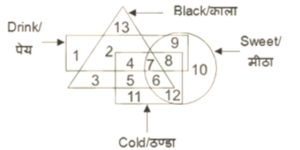 In the given figure, which number represents cold drink which is black and sweet? दिए गए आंकड़े में, कौन सी संख्या कोल्ड ड्रिंक का प्रतिनिधित्व करती है जो काला और मीठा है? Sol. 7 represents cold drink which is black and sweet. Q2. If a mirror is placed on the line AB, then which of the answer figures is the right image of the given figure? Sol. First part is the cause and second part is its effect. Except in the (d) option in which 2nd one is the cause. Q4. In the following question, select the number which can be placed at the sign of question mark (?) from the given alternatives. निम्नलिखित प्रश्न में, दिए गए विकल्पों से उस संख्या का चयन करें, जिसे प्रश्न चिह्न (?) के स्थान पर रखा जा सकता है. Q5. Three positions of a cube are Shown below. एक घन की तीन स्तिथियाँ दर्शाई गई है. ‘A और B’ चिह्नित दो पक्षों पर कौन सी संख्या आएगी? Q6. In the following question, select the odd letters from the given alternatives. Sol. +4 series except MS.
Q9. Present age of Saksham is one third of his father’s present age. 5 years ago Saksham’s father’s age was half the age of Saksham’s grandfather. If Saksham’s grandfather will celebrate his 88th birthday after 3 years, then what is the present age (in years) of Saksham? सक्षम की वर्तमान आयु उसके पिता की वर्तमान आयु की एक तिहाई है. 5 वर्ष पूर्व सक्षम के पिता की आयु सक्षम के दादा की आयु की आधी थी. यदि 3 वर्ष के बाद सक्षम के दादा अपना 88 वां जन्मदिन मनाएंगे, तो सक्षम की वर्तमान आयु (वर्षों में) कितनी है?